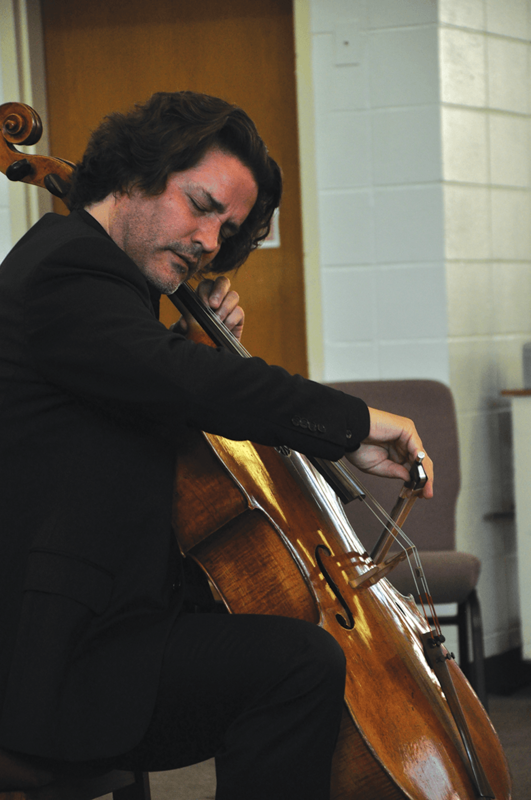 A Grammy Award-winning cellist, Zuill Bailey, performed an hour-long concert at San Quentin State Prison’s Protestant Chapel. Bailey is considered one of the premier cellists in the world, and yet he decided to play before an audience of prisoners, staff and volunteers in a place where few artists have ever set foot. After achieving so much renown, Bailey visited the prison on April 27 to share his music with men who rarely partake of the fine arts. “This is the first time I heard the cello play like that,” said inmate Eddie DeWeaver. “I want to know why I’m so tore up. I want to know why I’m crying,” he asked Bailey. Bailey did more than play. He educated the audience about the cello and the bow string (made of horse’s tail) and demonstrated how it works. He talked about the 100-year-old bow he used. It’s made from Brazilian wood. He described how rosin, made from tree sap, is rubbed on the bow to make the hairs stick to the strings on the cello. He described the Stradivarius as the greatest example of the cello. He said it’s supposed to make the lowest tone and its origin is that of a bass instrument. But the cello’s long neck and fretless construction allow a wide range of tone. “The cello has a maple back with spruce face and everything is held together by a weak glue,” said Bailey. He played the first three notes of the theme from the movie Jaws. “It (cello) was made to play Jaws,” he said as the audience laughed. Bailey opened his performance playing Bach Cello Suite No. 1. He didn’t have an orchestra or symphony to accompany him. He went at it alone and stunned listeners, some of whom had never heard a cello played live. He explained how the cello plays high notes and low notes. He said its best playing level is in the middle range, in the speaking voice. The range of high and low frequencies were sonically present as he played and the dynamics of slow rhythm, velocity, vibrato and melody emphasized the instrument’s uniqueness. There’s a difference between a solo artist and an orchestra, Bailey said. “Mozart didn’t write anything for the cello…So, for me to play Mozart, I have to get other musicians. The audience applauded Bailey between songs to show their appreciation for his performance. He told them he’s not around people much. “I wanted to be a musician. I didn’t understand the solitude,” said Bailey. “I’m by myself 95 percent of the time. Is this healthy?” He said 310 days out of the year he’s on the road performing around the world and talking to audiences is the only way he gets to have this kind of exchange. “I could play all day, but I wanted to have an exchange,” said Bailey. He talked to many of the people in audience in an impromptu question-and-answer session. He discussed how he sometimes feels before performing. “If I get nervous then, it means I care,” he said. “I have my utilitarian cello that I take around to places like Alaska, to kids and other places to make music accessible,” said Bailey. The following weekend he was scheduled to perform with the Marin Symphony at the Marin Civic Center. He said he will play in Istanbul, Turkey, soon. Someone listening to classical music for the first time would quickly realize Bailey is a virtuoso on the cello. He displayed an easy sense of humor, and given his standing in the music world, he was disarmingly humble. As the concert continued, Bailey performed Sarbande, Minuet 1 & 2, Gigue and Bach Suite No. 3, and he repeatedly engaged the audience. The chapel’s rectangular dimension and acoustics didn’t dampen the listening experience. Bailey, who attended the Julliard School of Music, used his cello to control the sound and tease the physics of space. Bailey talked about his hand size and how he discovered his left hand is larger than his dominant right hand. It grew after so many years of playing the cello at a young age. One day when he was a teenager playing basketball he accidently palmed the ball. 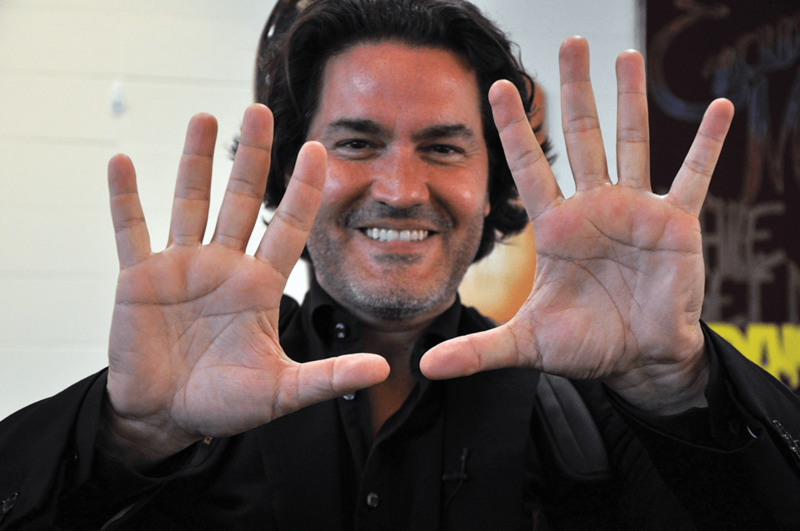 A friend pointed out that his left hand is larger than the other. At 15, Bailey was told he wasn’t good enough. But he said the cello reminded him that he was human. He said music taught him discipline. “All the things that come with being a musician are life lessons,” he said.